We've known about these little guys since May, and it sounds like they're starting to pop up in the U.S. According to Rockman Corner readers Jimb0, RockMax, and Derek, individual blind packages of Mega Man Figural Keyrings have been spotted at Target and Walmart in Washington, California, and Michigan, respectively. Characters include Mega Man, Rush, Dr. Wily, Guts Man, Cut Man, Elec Man, Ice Man, Fire Man, Bomb Man, Roll, and Proto Man. A few online retailers are loading up on these guys as well. Toywiz, Box Lunch, and eStar Land to name a few. Distribution is relatively new so we'll definitely be seeing these figures pop up elsewhere, too. Either way, these might make decent stocking suffers! Thanks for the tip, fellas! The figures themselves look fine, but I'm not fond of keychains sticking out of their heads - I would want them just as figures. ToyWiz and eStar Land have the same product blurb, making me believe they got the blurb from the same source. Unfortunately that means both sites refer to characters like Dr. Willy, Elect Man, and Boom Man. Anybody selling a full case instead of one blind pack at a time? Nice! I got a blind bag over the mail. I'll be buying the rest of the full set off ebay because I hate playing the blind bag game. These look nice. 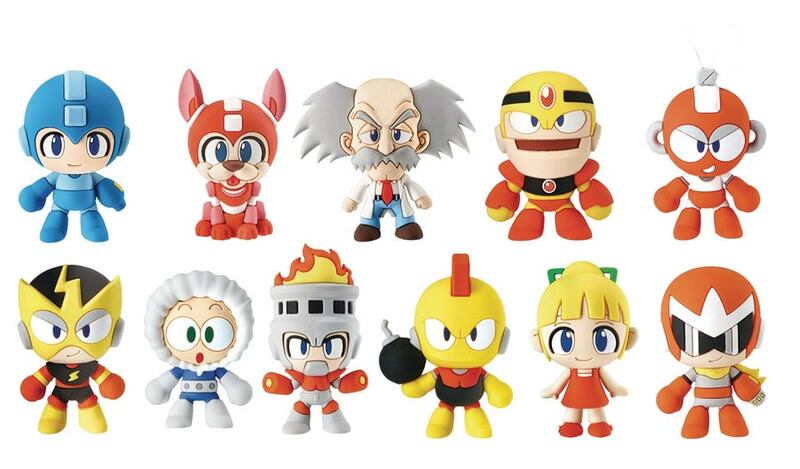 To someone's surprise, I also want the Dr. Wily one! And… maybe, Rush. So cute! I wish if they did a blind bag they would stretch beyond DLN08. Cant we get DWN RMs for once. :/ they do look nice though. There are so many figurine sets of the six original robot masters. Isn't it about time somebody took a crack at making legitimate 4-5" figures of them? Both the '94 Bandai line and the Jazwares Retro-Roto line made decent attempts, but both fell short of a few characters. Though I'm not expecting any miracles from Sentinel any time soon.. I've found them out in the wild, I just need bomb man, got extras of elec and fire though. Another Mega Man 1 centered line, but still no Time Man and Oil Man. I wonder why they always leave them out? Yeah they weren't introduced in the original Mega Man 1, but after Powered Up came out, they were accepted as canon in every other adaption of MM1 like the Archie Comics. When has capcom of Japan ever used Time Man and Oil Man outside of MMPU? Archie doesn't really count as "canon".